Growing up in Orange, NSW, Gregory (Greg) Dresser entered a career in recreation, sports development, and teaching, and worked as a teacher in Australia and the UK before moving into community development. In his career, Greg has worked in both public and private sectors, providing services and advice to community organisations, businesses and government agencies. Like many senior managers, Greg holds an MBA but took the additional step of undertaking a Doctor of Business Administration with his research examining the efficacy of publicly-funded small business advisory and training services. 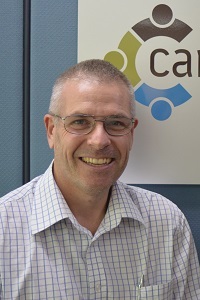 Today Greg is Senior Manager, Research and Evaluation with CareWest based in Orange. Managing a range of research projects in areas such as aged care, child and family services and disability care, Greg seeks to provide an evidence base for innovations that lead to improved service delivery and better outcomes for individuals and communities. Here Greg explains what attracted him to research and why he’s passionate about what he does. My childhood was… outstanding. I had the best parents and enjoyed every comfort and security. I chose CSU because… it’s Australia’s regional University. I had friends attending CSU and it was close to my parents and my home. My best experience at CSU was… living on campus during my undergraduate degree. Endless coffees and Thursday nights at the bar – I can even remember some of them. My worst experience at CSU was… the late and lonely nights analysing data and writing a thesis that perhaps only a few people would ever read. At university I was inspired by… my supervisor, Associate Professor Geoff Bamberry, a truly wonderful teacher and mentor. Today I’m motivated by… a belief that as individuals, and as a society, we should be judged on the way we treat our most vulnerable. In my profession it is important to… build relationships. Research can sometimes be quite theoretical... My current role allows me to test hypotheses in the real world – a living laboratory if you will – and examine the impact of various services and initiatives. I often get to see first-hand the impact of the innovations we’ve made to service delivery. And, of course, we’re operating in an environment that’s focussed on helping individuals and communities, so I sleep pretty well at night. I’m passionate about what I do because… we improve lives (or at least try to). The biggest influence in my life is… my Mother. While Mum died in 1991, I remember her daily and her advice from my childhood and our love for each other spans the years. I’m most proud of my Father. Dad was honest, hard-working, caring, and an all-round good bloke. He was (and is) well known in my home town of Orange, and people still approach me to tell me how they knew Dad, and often they’ll tell me how Dad had helped them in some way. My motivation is… trying to make a positive contribution while at the same time trying not to hurt anyone. Mum and Dad can take credit for providing me with that. My greatest achievement is… talking my wife into marrying me - I’m a lucky fella, she’s quite the catch. In the future I’d like to… make a contribution that has a significant impact on the way people live their lives. The single-most important issue in the world is… poverty. I understand that we’re making some progress in this regard, but there’s a long way to go. My advice to young graduates just starting out… everything operates within a complex system of shifting politics, policy, and practice. Things aren’t always as they seem – a wide variety of people are usually coming at a situation with lots of different ideology and associated baggage. Try to understand the issue from their point of view (and understand their agenda). One last thing... and I can’t stress this enough – when entering a roundabout, indicate ‘right’ when you’re turning right, indicate ‘left’ when you’re turning left, and in all cases, indicate ‘left’ when you’re exiting the roundabout. Come on! How hard can this be?